The day is not quite over yet, in fact it has just started as I sit here in the internet cafe in Makarska. I figure I should get to Split today. So just a quick update for today. I haven’t been cooking pasta or other things lately, opting for bread and other ingredients for quick meals instead. This means that I am spending about 50 to 60 Kuna per day here in Croatia (about 7 Euro, or 10 USD) for food. My main costs after food, actualy, my only cost after food, is internet. The place I am at now is 24 Kuna (4.30 USD) an hour. I just have to accept it, but it’s hard after spending the last 7 months sometimes only paying 0.50 USD per hour! For the time being however, things are looking good for today. I will make as much ground as I can while the weather is good. Old-as-the-hills hills in the background. 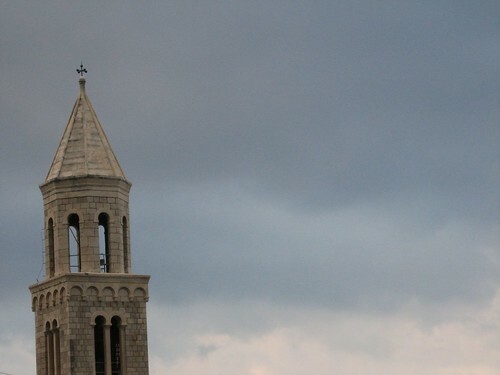 Its a shame you have bad weather there in Makarska. Scenery is impressive, very simillar to Kotar. Mountains of Biokovo that rise straight from the sea are paradise for paragliders! Makarska is also very popoular holliday destination, also because it offers a lot of sport activities. I am planning mountaing biking adventure in Biokovo for next year. Do you end up carrying small changes in various currencies? I did with many coins during my first European Eurail trip – they didn't have Euro back then. I swapped them with other fellow backpackers travelling opposite direction. UNICEF collects coins in any currencies so you can donate them when you fly next time (most international airports usually have UNICEF donation boxes and envelopes). Of course you can use em up by purchasing sweets and postcards. We just had a freeway charity bike ride yesterday that's done by closing off a section of freeway (highway, motorway however you call it) for about 30km between Perth and Joondalup and let 7011 (yes, seven thousand and eleven) participants who had donated money for athma foundation rode on their own bike at their own pace. We were in group B which is not peloton just fitter young, very young and not so young people ride 30km in about an hour. About half of people had a road bike and the rest had mountain or something in between. Didn't see a recumbent in our group B though my colleague told me today that he arrived a bit late for group B and there were some bent bikes about. A good preparation for when the petrol becomes too expensive and the major roads open up for us cyclists, according to my boss!! Lee, the decision about the summer camps was a complex one. You see, I am feirly certain that I could get a job in London doing translation. Translation is something I know I can do. Give me a 20 page document in Japanese and ask me to translate it to English, and I could do it. I would earn good money doing it also. But, I have a hunch that I may have something to offer in the field of outdoor education. And that enhancing and empowering the lives of people in the process is something worthwhile. It is only a hunch however. That makes the decision to apply to the summer camps scary and at the same time exciting. But hey, it's only a summer. If it's not something I can see myself suited to, then it's not the end of the world. Sometimes you gotta take a big step out of your comfort zone to dig deeper. 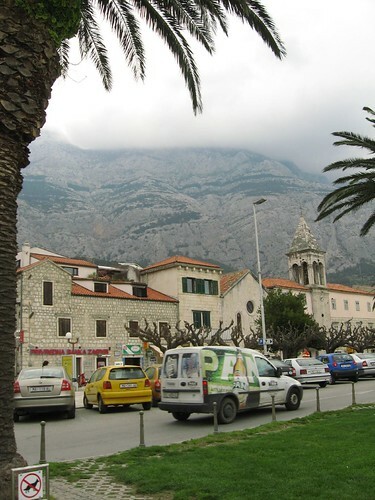 Aleksej, did you know that there is a road that goes up from near to Makarska to the 1700m high mountain behind it? I just found out that the road is paved all the way! Gutted. If the weather wasn't so bad, I would have taken a ride up. There are lots of small paths througout this area which would be great fun on a mountain bike. Satoshi, I colleceted quite a few bank notes from central Asia, but got rid of the coins as much as I could. Paper weighs less than metal 😉 The bike ride looks like fun. Needs more recumbents by the looks of things though. Just having a look at the 2007 photos of the event, I see some hand cycles. I wonder how fast those guys go. Looks like fun. Yes, this paved road is good thing when climbing almost 1700 meters of height difference! As I know, motorists must pay a tax to drive this road. I am not shure if its possible to drive with car all the way to the top, because there is national nature park Biokovo. The view form the top is astonishing as I saw on the fotos. Rob, I have "interesting" news for you. It˙s snowing hard in Slovenia today… I hope the weather will change soon! Aleksej, hard snow is not good news 🙁 Nothing I haven't already experienced though I guess 😉 Ha! True, Rob – it's kinda freaky facing big (and sort of mutually exclusive) possibilities for the future. Did a version of it myself in 2000/2001. 'Good money' can be very useful for very honourable and worthwhile purposes, too – so earning lots isn't necessarily the 'wrong' decision. Glad to hear your ticking along, erm the summer school thing is good fun I've done it. The pay was very average well actually worse than that it was terrible. However having a laugh and meeting loads of people made up for it I guess. Weather here is rubbish, I was thinking about something complex and if you mail me perhaps we could work out a deal? PS I hope this sounds suitably suspect for all the other blog watchers. you sure you've been out cycling across the biggest landmass? you got back faster than some of my so called clients do. Have emailled you with rough outline probably makes no sense.